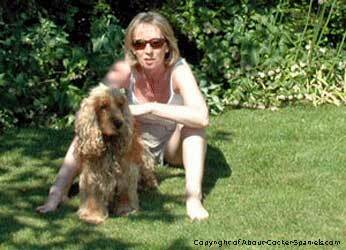 Hi, my name is Pauline and this is my website about Cocker Spaniels! I'm originally from the North East of England but around eight years ago I retired and relocated to the south of France. I'm now living the dream in a beautiful village located just off the Mediterranean coastline. Max (my golden cocker spaniel) and I are lucky enough to enjoy long leisurely walks through the vineyards and romps along the local sandy beaches. Retired At Last. Bliss, Or So I Thought! In 2008 I was lucky enough to be able to take early retirement. It felt good not having to join the 'rat race' every day. I was finally able to do what I wanted, when I wanted! Life slowed down to an acceptable, relaxed pace and I began to enjoy my new-found freedom, one leisurely day at a time. I'd always had dogs in my life, but never felt comfortable about owning one while working full-time, believing I wouldn't be able to give it the care and attention a dog would need. Now that I was retired, I had all the time in the world! Between us, hubby and I have over 30 years' experience of owning dogs (and cats too!). I was 6 years old when we got our first rescue dog (a 'Heinz 57' variety!) and we named her Jenny. She gave us many years of love and affection and was very loyal to the whole family. Our next dog was a noble-looking Afghan hound whom we named Prince. Although he was a beautiful dog he was very 'highly strung' and needed an awful lot of attention and handling! And then we acquired a wonderful German Shepherd. We took him in because his family could no longer afford to keep him. He was an enormous, fierce-looking black dog, inappropriately named Demon as he was the biggest softie I've ever known! Sadly, they all eventually left this world and I began my life as an adult. But Which Breed Should I Choose? Once retired with time on my hands, the 64,000 dollar question was, which breed do I choose? Over the years, hubby had owned several Cocker Spaniels, and absolutely adored them. After much research (on my part) and not a lot of persuasion from hubby, I decided to plump for an English Cocker Spaniel puppy. I just couldn't resist their adorable little faces with those big brown eyes and soft floppy ears! So, a few weeks after retiring I returned home from the breeders with an adorable, beautiful, 8-week old golden Cocker puppy. I had lots of time to enjoy him. He was a bundle of laughs and a breath of fresh air! Max is my best buddy (apart from hubby, of course!) and I can't imagine my life without him. Just like babies, puppies can be very time consuming and together with all the odd jobs that I'd been putting off around the house and in the garden, I was fully occupied. was about to happen next...! Something Missing From My Life..? As Max began to settle down and grow out of 'puppy-hood', and most of the jobs around the house were completed, I found myself with more and more time on my hands! I began to feel unfulfilled and often felt 'at a loose end', after all, there's only so much housework and gardening you can do! Although I was happy, I felt there was something missing from my life, but I just couldn't work out what it was! Imagine my surprise when I finally realized that what I was missing was work and the sense of structure and purpose that it brings! that I was bored with it!" I certainly wasn't prepared for that! I considered the possibility of a franchise but nothing suited. They were either too expensive or needed too much time working outside of the home. I looked into all sorts of possibilities, but just couldn't get off the starting blocks! I didn't have a clue what I was going to do. I was certain of one thing though. I wasn't going to sit back and do nothing! build and manage from home!" At that time, I had no idea what type of business that might be, let alone where or how I would begin. And then a dear friend whom I'd known for many years mentioned, quite out of the blue, that he had a website which earned him a good income. "He let me into his secret..."
I listened with interest to how he'd used a company that provided all the tools necessary to help turn your passion, hobby, or skill, into a profitable website business. It sounded like this could be just what I was looking for, but with the added bonus of an income! I was slightly apprehensive about the technical side of building a website as I had no real IT knowledge. I could use a computer for the basics, and could surf the internet, but that was the extent of it! As it turned out, I didn't need any real computer expertise or experience of programming, web design or web building. This company gives you all the tools you need, not only to build a website, but to build a successful business. And if that wasn't enough, they help you through the entire process, step-by-step and at your own pace. They hold your hand all the way! "...and that's how I discovered ... Site Build It! (SBI!)" Since discovery SBI I've never looked back. I love working on my website and I love the fact that my site has thousands of visitors each month - something I'd never have been able to do on my own. If you'd like to hear more about how I built this website, and more importantly, how you can do the same, you can do so here.